Pacific Eye & Ear now selling originals and limited-edition prints of iconic album cover artwork. 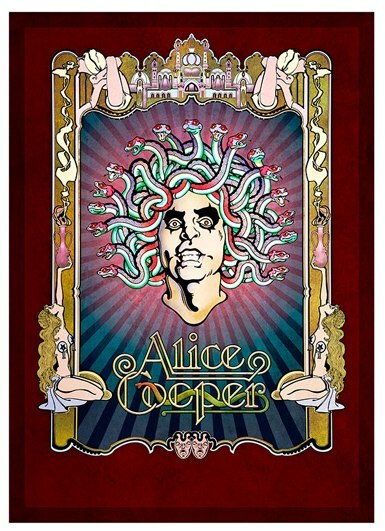 Portland, OR – based art seller RockPoP Gallery appointed exclusive distributor of fine art prints featuring Alice Cooper, Aerosmith, The Bee Gees, Black Sabbath, Earth Wind & Fire, Iron Butterfly, Jesus Christ Superstar and many others. In the early 1970s, no album cover design agency in the U.S. was hotter than Pacific Eye & Ear. Started in 1972 in Los Angeles by designer Ernie Cefalu after stints on Madison Avenue and with album cover designer Craig Braun, PE&E was built around a team of incredibly-talented young artists who brought the agency’s clients music packaging designs that captured the hearts and eyes of music lovers worldwide and built a portfolio of images that, to this day, are considered amongst the most-iconic of all time. 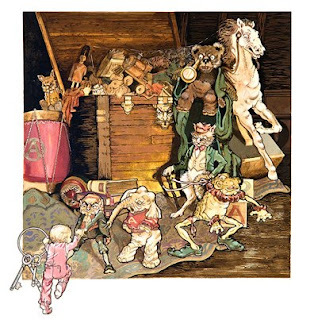 Who doesn’t remember the first time they saw Aerosmith’s Toys In The Attic, or Alice Cooper’s Billion Dollar Babies? Black Sabbath’s Sabbath Bloody Sabbath or the 3-D lenticular image on the cover of Captain Beyond? PE&E’s range of work was simply astounding and the talents of each of the associated artists (Drew Struzan, Ingrid Haenke, Bill Garland, Joe Garnett, Carl Ramsey, as well as Cefalu himself) would soon translate into their own success and/or fame after the agency disbanded 13 years later. In particular, Cefalu would go on to create greatly-admired campaigns for a wide variety of clients both in and out of the music business, while Struzan would gain world-wide attention for his theatrical posters for block-buster movies such as Star Wars, Indiana Jones, The Muppets, Harry Potter and many others. Now, for the first time in over 30 years, some of the best-known works from the PE&E archives are available for sale to music fans and art collectors worldwide as part of the Original Album Cover Art collection (http://www.originalalbumcoverart.com). Over 250 original works of art are offered – original paintings, drawings and sketches – as well as a series of limited-edition fine art prints derived directly from the original works in this archive. In November, 2010, PE&E/OACA released the first five items in what will be a growing portfolio of highly-desirable album cover art prints. With production overseen by Cefalu himself, these prints are produced using only the best materials in order to enhance the visual impact of each of the images. Each finished print in both the unsigned ("Standard") and artist-signed ("Signature") editions is hand-numbered and stamped with the PE&E Corporate seal to ensure authenticity. Each print is accompanied by a Certificate of Authenticity (a work of art in itself, featuring sample images from the collection), also signed and stamped by Ernie Cefalu. Jesus Christ Superstar Angels – The package for Rice/Lloyd-Webber’s ground-breaking rock musical featured these angels, recreated here in stunning detail by their creator, Ernie Cefalu. When thinking about the labor of love that produced this collection of images, Ernie looks back in wonder at his timing and good fortune – "Early in my career, I was sent from New York to LA to open the West Coast Satellite office of a creative agency. It was with this company that I conceived and designed the original Rolling Stones Tongue logo, Cheech & Chong’s Big Bambu, Grand Funk Railroad’s E Pluribus Funk and Alice Cooper’s School’s Out album cover designs and packaging. In 1971, I started my own company, Pacific Eye & Ear, which became a main player in "the golden era" of album cover art. As a young designer, I had the honor and privilege of working side by side with many great, emerging artists. For 13 years, as Pacific Eye & Ear’s Creative Director, I was the creative thread that linked together some of the world’s top illustrators, designers, writers and photographers. It was a luxury for an agency to have even one good illustrator in your arsenal, so imagine having Drew Struzan, Ingrid Haenke, Bill Garland, Carl Ramsey and Joe Garnett all at the same time! That’s what I call, real illustration muscle! I am so happy to finally be able to offer some of these works to collectors and am truly humbled and honored to have received so much positive feedback about this effort from fans all over the world. I’m also happy to have found a kindred soul in RockPoP Gallery owner Mike Goldstein, and I am eager to work with Mike and the dealers he selects to promote these editions and help them find good homes!" Goldstein adds – "After meeting Ernie during an interview I did with him about his career, I was amazed to find out that he’d never produced fine art prints of his works. As someone who has made it his mission to advance the appreciation of album cover art and artists in the fine art world, I knew that it was simply a matter of time before I’d take that final step beyond simple reseller to become involved first-hand in a print publishing effort. You can only imagine how lucky I feel to have been able to help Ernie, Drew and the rest of the PE&E team realize their dream to bring the fruit of their labor to art collectors and fans of album cover art worldwide!" 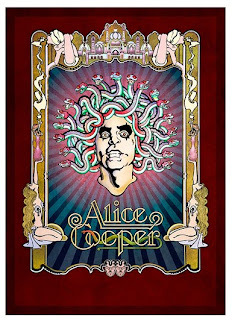 Upcoming Releases – Upon completion of production, PE&E/OACA will also be releasing additional titles, including Alice Cooper – Billion Dollar Babies and Welcome To My Nightmare, Black Sabbath – Sabbath Bloody Sabbath, Bee Gees – Main Course and Iron Butterfly – Scorching Beauty (with more to come). These titles all feature the art/ illustrations of Drew Struzan. Select art galleries are being sought for additional representation – please contact Mike Goldstein at RockPoP Gallery via email at info@rockpopgallery.com for additional details about these prints and dealer/gallery resale programs. – An online fine art gallery based in Portland, OR, RockPoP Gallery is dedicated to bringing customers the best selection of limited-edition, rock and pop music-related art prints, photography and related collectibles available on the market today. With a focus on album cover artwork, our Gallery collection features over 650 examples of artwork, illustrations, photographs, illustrated lyric sheets and sculptures from the leading artists in their respective fields. RockPoP Gallery was founded in 2005 by Michael Goldstein, a former television and interactive programming development, creative and production executive and long-time collector of music-related artwork. Since that time, RockPoP Gallery has helped music fans and collectors worldwide buy copies of some of the most cherished images from the last 40 years of rock n’ roll albums, CDs, promotional materials, concert photography and other imagery, allowing these customers to decorate their homes, apartments, and workplaces with the highest-quality products at highly-competitive prices. RockPoP Gallery relocated from Long Island, NY to Portland, OR in September, 2008.